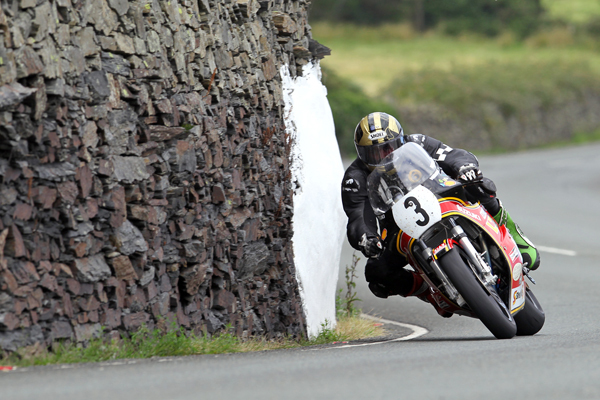 Michael Dunlop won the Motorsport Merchandise Formula 1 Classic TT race, breaking lap and race records for the Classic class. The Northern Ireland rider shattered his old Formula 1 record of 118.186mph, which he set in the 2010 Manx Grand Prix, on his way to victory. In the concurrent Formula 2 Class Chris Palmer took his second win of the day while in the Formula Classic Class Dean Harrison, who achieved his first mountain course podium at this year’s TT, topped the board for his maiden Mountain Course victory with a narrow victory in the Formula Classic Class. 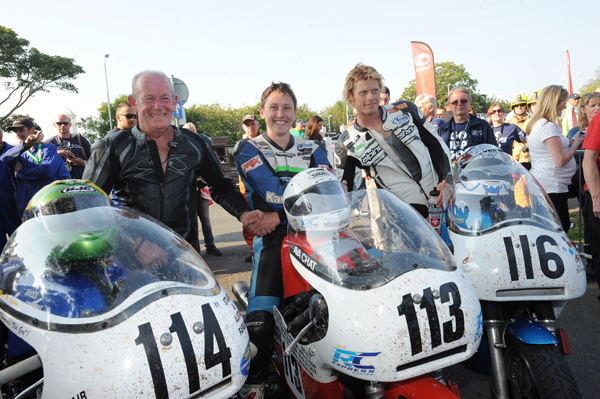 Before the race, Clerk of the course Phil Taubman reported that roads were dry all around the course for the final race of the 2013 Classic TT presented by Bennetts. 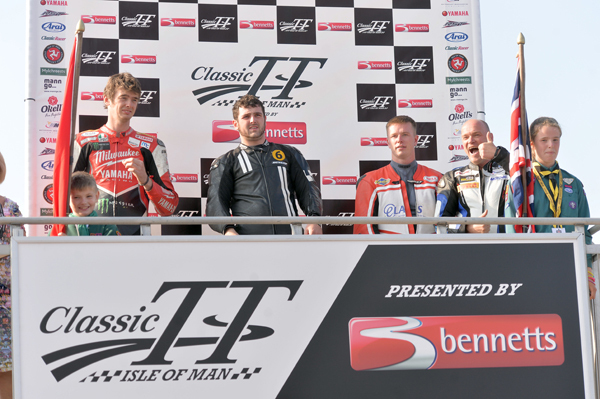 James Hillier, as he did with this year’s TT Races, had the honour of the number 1 draw on the CSC Racing Honda, with Steve Mercer on the Yamaha Classic Racing Team bike starting ten seconds behind with pre-race favourite Michael Dunlop on the Team Classic Suzuki third away. As expected Michael Dunlop was first to Glen Helen, nine seconds ahead of Team Classic Suzuki Teammate Conor Cummins with Gary Johnson on the Team Winfield Harris a couple of seconds further back on the Manx rider. Dunlop was quickest on the opening lap, posting his record-breaking lap, leaving Cummins over thirty seconds behind with Gary Johnson holding third and Mercer and Manxman Ryan Kneen on the DMR Yamaha, with opening laps of 19:11.930 (117.913) and 19:12.45 (117.860) respectively, completed the top five. Dunlop’s second lap (18:22.531, 123.196) slowing down for the pits, saw him establish a lead of almost a minute from Cummins (18:44.258/120.815) with Mercer holding third a further thirty seconds back. With Gary Johnson dropping down the field, Ryan Kneen moved up to fourth and with Coward and Johnson retiring at Glen Helen and Crosby respectively, John Barton on the wemoto.com Kawasaki moved into the top five. Dunlop kept his minute lead over Cummins on the third lap with Ryan Kneen moving into third place at Mercer’s expense. Mercer’s challenge for a podium spot came to an end when he slid off at Ramsey Hairpin but the Kent man was reported as okay. Dunlop duly took the race win with 1:15.13.79/120.36mph) from Cummins (1:16.13/ 118.790 with fellow Manx rider Kneen, the 2008 MGP Newcomers A race winner, (1:17.19.158/117.015), taking the final podium position. 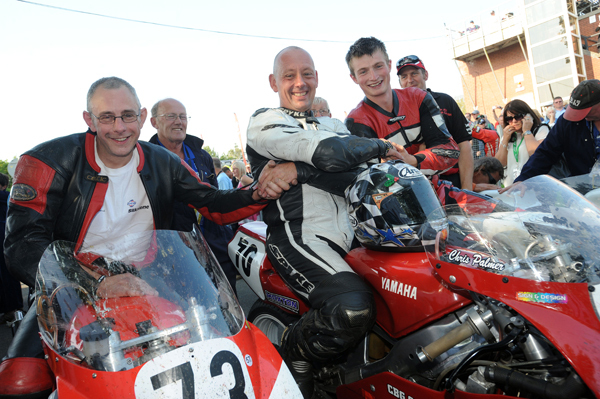 Kneen cut it fine and actually ran out of fuel in the return lane and pushed his machine into the winners enclosure. Adrian Cox on the Top Gun Racing/RAF took the privateer honours. Chris Palmer on the Rob Brew Racing Yamaha was first away in the Formula 2 Class, fresh from his victory in the Okells 350cc race. James Cowton on the Peter Berwick Yamaha was next with Roy Richardson on the FCL Racing/Martin Bullock Manxsport Yamaha third away from the line. Palmer was fastest to the first checkpoint at Glen Helen establishing a three second lead from Phil McGurk on the Springcourt Motorcycles Yamaha with Cowton third a further second back. Palmer’s completed his opening lap in 20:30.150/110.416 to lead Cowton (20:36.637) by six seconds at the end of the first lap. However, Cowton moved ahead of the Isle of Man based rider on the second lap with a 20:14.142/111.872mph lap, establishing a lead of just over two seconds with Palmer and McGurk completing the top three. Palmer came back at the Yorkshire rider on the third lap, clocking 21:12.082/106.776 to lead him by twelve seconds with McGurk (21:50.767) retaining third and that remained the top three at the Grandstand with Palmer winning in 1:22.21.694/109.944, eleven seconds ahead of Cowton (1:22.32.656/109.701) with McGurk (1:23.45.022/108.121 finishing in third. Chris Moore (1:25.14.017/106.240) in fourth place on the Yamaha was the first privateer back. In the Formula Classic the race went right to the wire with Gavin Lupton and Dean Harrison swapping positions throughout the four-lap race. Harrison established a ten second lead by the end of the second lap but it was clear that he was experiencing problems on the third lap and Gavin Lupton built a commanding lead of over a minute going into the last lap. Harrison came back at him on the last lap and, in an astonishing finish, he somehow clawed back two seconds from Cronk-Ny-Mona to take the win by 0.174 with a time of 1:28.06.283/102.778, the second closest finish ever on the TT Mountain Course. In the winner’s enclosure, Harrison reported that his tank had come loose and he held it in place between his knees for the remainder of the race. Lupton (1:28.06.457/102.774) was left with the consolation of finishing as the fastest privateer and Chris McGahan took the final podium position in a time of 1:28.26.491/102.386. Hat dir der Beitrag gefallen? Dann spende doch etwas oder verbreite es unter deinen Freunden.